I put in holds for some comics last week and they’re here! I also had time to browse the comics shelves and grabbed a few more. I am however extremely disappointed to note that most the comics and graphic novels here in this post are by white authors. I do have some comics by POC authors up for Comics February (including the excellent Sonny Liew) but obviously not in this library loot. I’ll have to do better next time! THEFT done well is not CRIME it is ART! Bandette returns to steal readers’ hearts once again! The teenaged master burglar has thrown down the gauntlet with the Great Thieving Race, and friendly rival Monsieur has stepped in to take the challenge. This second charming collection of the Eisner Award-winning series sees the two competing to steal the most priceless artifacts from the criminal organization FINIS and turning over whatever they learn about its plans to the long-suffering Inspector B. D. Belgique. But FINIS’s response could make this Bandette’s final crime spree! Have had my eye on this for a while. Marble Season is the semiautobiographical novel by the acclaimed cartoonist Gilbert Hernandez, author of the epic masterpiece Palomar and cocreator, with his brothers, Jaime and Mario, of the groundbreaking Love and Rockets comic book series. Marble Season is his first book with Drawn & Quarterly, and one of the most anticipated books of 2013. It tells the untold stories from the early years of these American comics legends, but also portrays the reality of life in a large family in suburban 1960s California. Pop-culture references—TV shows, comic books, and music—saturate this evocative story of a young family navigating cultural and neighborhood norms set against the golden age of the American dream and the silver age of comics. Middle child Huey stages Captain America plays and treasures his older brother’s comic book collection almost as much as his approval. Marble Season subtly and deftly details how the innocent, joyfully creative play that children engage in (shooting marbles, backyard performances, and organizing treasure hunts) changes as they grow older and encounter name-calling naysayers, abusive bullies, and the value judgments of other kids. An all-ages story, Marble Season masterfully explores the redemptive and timeless power of storytelling and role play in childhood, making it a coming-of-age story that is as resonant with the children of today as with the children of the sixties. Found this while browsing the comics shelves. Looked interesting. Samantha and George are a couple heading towards a sabbatical year in the quaint Mexican town of Oaxaca. For Samantha, it is the opportunity to revisit her past. For George, it is an unsettling step into the unknown. For both of them, it will be a collision course with political and personal events that will alter their paths and the town of Oaxaca forever. In tandem, the remarkable and arduous journey that a Monarch butterfly endures on its annual migration from Canada to Mexico is woven into Ruins. This creates a parallel picture of the challenges of survival in our ever-changing world. Ruins explores the shadows and light of Mexico through its past and present as encountered by an array of characters. The real and surreal intermingle to paint an unforgettable portrait of life south of the Rio Grande. Sorry, no idea who Andrew “underground sensation” MacLean is. But I just like the idea of cat named Jelly Beans. Alone at the end of the world, Aria is woman with a mission! Traipsing through an overgrown city with her only companion, a cat named Jelly Beans, Aria’s search for an ancient relic with immeasurable power has been fruitless so far. But when a run in with a creepy savage sets her on a path to complete her quest, she’ll face death head on in the hopes of claiming her prize and, if all goes according to plan, finally returning home. Yeah, so it’s another Lucy Knisley! Midnight picnics at the Eiffel Tower; wine tastings paired with blowgun lessons; and romance in cafés, cemeteries, and at the Brandenberg Gate–these are just some of New York Times best-selling cartoonist Lucy Knisley’s experiences on her 2011 European book tour. An Age of License is both a graphic travelogue and a journal of her trip abroad. Fans of Knisley’s food-focused autobiography (French Milk, Relish) savor her mouth-watering drawings and descriptions of culinary delights, seasons with cute cat cameos. But An Age of License is not all kittens and raclette crepes: Knisley’s account of her adventures is colored by anxieties about her life and career, depicted with fearlessness, relatability, and honesty, making An Age of Licensean Eat, Pray, Love for the Girls generation. I kept seeing this around the book blogosphere. Can’t remember exactly who read this one, so hands up if it was you! I enjoyed, well enjoyed isn’t quite the word for it, perhaps I should say I was moved, by Chast’s Can’t We Talk About Something More Pleasant? a graphic memoir about her elderly parents. So am curious about this one. The pages of the New Yorker are hallowed ground for cartoonists, and for the last thirty years, Roz Chast has helped set the magazine’s cartooning standard, while creating work that is unmistakably her own- characterized by her shaggy lines, an ecstatic way with words, and her characters’ histrionic masks of urban and suburban anxiety, bedragglement, and elation. What I Hate is an A to Z of epic horrors and daily unpleasantries, including but by no means limited to rabies, abduction, tunnels, and the triple-layered terror of Jell-O 1-2-3. With never-before-published, full-page cartoons for every letter, and supplemental text to make sure the proper fear is instilled in every heart, Chast’s alphabetical compendium will resonate with anyone well-versed in the art of avoidance- and make an instructive gift for anyone who might be approaching life with unhealthy unconcern. Hey look! Not a comic! I’ve been in the hold queue for this one for a bit so am glad to finally get it. May be hitting a bit too close to home what with the drought and all. But I’m typing this on a cloudy slightly drizzly day so there’s still hope. This is such a great loot. 🙂 I haven’t read a lot of comics. 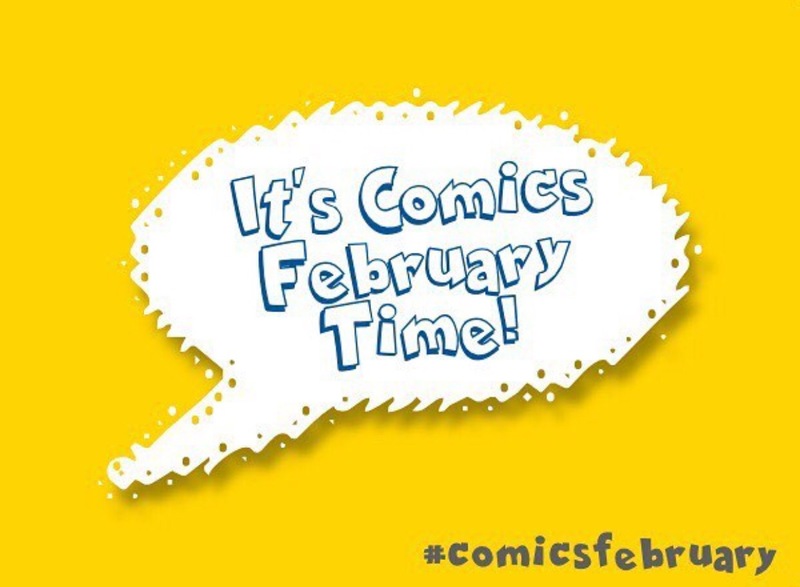 Your lovely blog gently steers me towards exploring comics. Thank you. 🙂 Chennai (India) hasn’t got a great library. There are a couple, but sadly, they loan some mainstream, popular books. But, I am adding this list to my TBR. I should be lucky enough to lay my hands on these books in good time. 🙂 By the way, Jelly Beans sounds awesome. Thanks so much for your kind words Deepikq! I am indeed fortunate that I live in an area with a pretty decent library although I must say it cannot compare with the libraries in Singapore where I’m originally from! Can you put in requests at your library for them to purchase other books? Ok so here’s what I did… I searched for graphic novels and comics on my library’s online catalogue and just requested stuff that looked vaguely interesting!